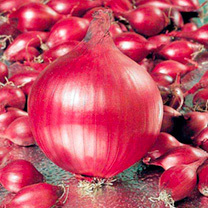 This is a uniform variety with an excellent skin, great flavour and is a beautiful ruby colour. Due to its strong root system this variety is very productive and is suitable for long term storage. Heat prepared onion sets. Why buy heat treated onion sets? - It's frustrating when your beautifully forming onions decide it's time to develop seed and send up a flower stalk. Heat treating is a process that we carry out on your behalf to prevent this happening. Heat treatment starts in November depending on the size of the bulb. During the heat treatment, the onion sets are gradually heated up over 12 days from the 3-5°C storage temperature to 30-32°C and, depending on size, are kept at this temperature for 30-60 days (during which time they are heated up to 32-35°C for 10 days) and then gradually cooled to 10-14°C for planting in April/May. So whilst they are a little more expensive, you can be more confident of harvesting onions you can be proud of!